I am often asked, "how do you stay motivated?" and "how do you make sure you eat healthy?". I have thought a bit about it, and I just fake it till I make it! You may wonder what the heck that means... Let me explain! - I know eating cookies and milkshakes won't give me a flat stomach: Instead of never allowing treat meals, I allow them every now and then. I see temptations daily, and know they will be there the next day and the next. I can talk myself in to knowing I won't miss them and they are always there. 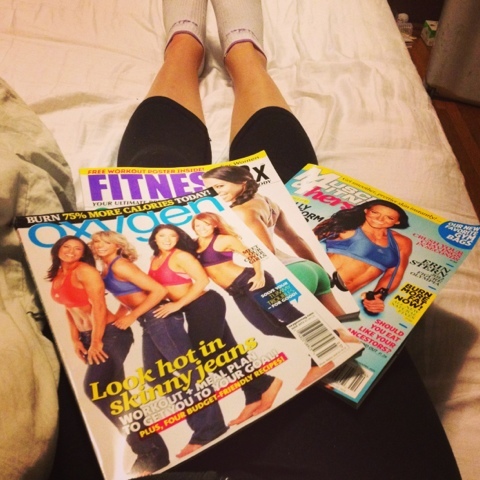 - I read up: If I need an extra boost in the gym, I grab one of my favorite magazines and look for some new moves to incorporate! - Keep my goals around: sometimes I have a list, sometimes photos, or set daily phone reminders to keep me focused. If I know my low of the day is 3pm, I set a reminder to GET UP or TAKE A WALk. - Cook new and different foods: When chicken and veggies is boring and you feel like there is no way to stick to your diet, switch up the flavors! One night may be Mexican spiced, one night indian spiced, another Italian, or my favorite Hawaiian (pineapple relish). - Make clean treats: You can stay on your plan, motivated, and reaching your goals with sweet treats. Check out my posts for some ideas on 100% clean treats! I hope you know you can reach every goal you set! The motivation is in there, you just need to find it!